Kingdom Come is a hard rock band fronted by Hamburg-born vocalist Lenny Wolf. The group was formed in 1987 after the breakup of Wolf's moderately successful rock project Stone Fury. Wolf recruited lead guitarist Danny Stag, Rick Steier (guitar) and James Kottak (drums) and Johnny B. Frank on bass. Stag and Frank had previously been members of the bands WWIII and Population 5. 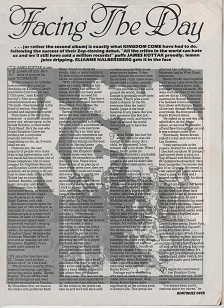 Kingdom Come marked the first band where Wolf sang without playing guitar. The frontman later admitted that, for a while, it was a very awkward adjustment. In 1988, the band released its debut LP, Kingdom Come. The band's first single, "Get It On," was a big enough hit on AOR stations that the band's eponymous debut went gold. Their second single/video for the power ballad "What Love Can Be" received much airplay on US radio and MTV. By the time the single/video "Loving You" was released, the album had sold to platinum status in the United States, Germany and Canada, among other music markets. The band was chosen to open for the North American Monsters of Rock tour in 1988, supporting Dokken, Scorpions, Metallica and Van Halen. Following that, they were tapped to support the Scorpions on their North American "Savage Amusement" tour, until they were forced off. According to Stag, Lenny Wolf found the stage ramps reserved for the Scorpions' set irresistible. After several reprimands from The Scorpions' management, the singer continued to use the full stage and the band was asked to forfeit the rest of the tour. Coincidentally, Scorpions were also signed to PolyGram, though only in America. Quickly, the band was directed by management and Polygram to get a new recording available. 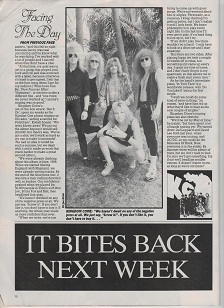 In 1989, Kingdom Come released their next LP, called ‘In Your Face’. However, the subsequent backlash against the band's perceived appropriation of a similar Led Zeppelin sound (earning them the derisive moniker of "Kingdom Clone") hurt their commercial appeal, and after the band's second album failed to sell well, all members other than Wolf quit the group.